A conversation at the local market, a professional relationship which turned into friendship and the will to use rather than waste made the story of this jam. On Saturday I went to the local market to buy some apricots and I stopped by a stall where I looked at some pretty ones, perfect to make a picture I had in mind. I also wanted to buy three ripe peaches for my aunt who was disappointed by the floury ones she had purchased the day before, and some strawberries for dessert. The female greengrocer looked at my hoodie featuring the logo of a dance center and asked “are you a dancer?” I replied that I was just promoting a very good dance school. She told me that her daughter was thinking of learning classical dance and we started a conversation. This is when she took peaches and nectarines from below the counter that were not suitable for sale because overripe. Perfect for me, I wanted ripe and juicy fruit for a fruit salad, we would keep the three other peaches for later days as they still needed to ripen. So I went back home with five more yellow and white peaches and nectarines that were given to me for free while the greengrocer had received some advice for her daughter. Which just shows that a conversation can lead to more. It happens that my father had already bought strawberries and that in the end I didn’t make my fruit salad. So on Monday morning I was left with most of the strawberries and the five peaches and nectarines, which had partly started to rot. What to do with them? Jam was the solution, as it is the safest way of using damaged fruit. Last week, a former client of mine who then became a friend had given me frozen red currants from her aunt’s garden. I thought I would add some of them to the mix, to provide some acidity and help the jam set. So did I, which makes this jam partly made with fruit from a local garden. Which also shows that work isn’t always about work and may evolve into other kinds of relationships. What used to be a collaboration for the production and marketing of Cantal cheese, the French equivalent of Cheddar, a pressed non-cooked cheese which leaves up to the finest delicacies when made with raw summer milk from cows grazing on highland pastures and when aged in maturing cellars with ambient microbial flora developed over decades of continuous care… What used to be a professional collaboration was I saying, has become a friendship partly based on the habit we have to share produce from the garden and the stove. Garden fruit is not only about quality fruit, it is also about quality relationships. Regular readers of this blog will probably have already realised that this is at the heart of my motivation for publishing ‘Les jardins d’ici’. In the end, what would have finished in a bin in many homes because of a duplication of purchases and an unexpected change of eating plans became three large jars of a sweet breakfast spread steeped in a pleasant personal experience. The mix of fruits happens to be peach, strawberry and red currant, it could have been different. The jam could also have been made with fruit in perfect condition, it would have been better at least image-wise. And I could have removed the few red currants’ pips, too big to feel good in the mouth. As for taste, it will be for tasters to say in a week or so, as it is the first time I try this combination of fruits. But I have my blog story, and overall I wish it inspires others to put some soul in their jam works. Food is better with some sort of story around it. The three 500g jars produced. Actually my friend also lent me her camera to take the pictures. Image 18th August. Basically I quickly removed the rotten parts from the fruits, peeled the peaches and nectarines – it was easy because they were quite ripe – added the red currants and the strawberries, 600g of sugar per net kilo of fruit (peach and strawberry make quite sweet jams so I put less than my usual 700g), and immediately cooked the mix for fifteen minutes over medium to high heat. It is too early to say whether the jam will slightly set or not, the red currants may help, yet it already has a pleasant consistency, not too runny. Good on toasts in my view! As for taste, it is a bit early to say as well, as juices should continue to penetrate the morsels in the coming days, which were not macerated in sugar prior to cooking. The red currants bring some acidity and the amount of sugar seems right. The jam will have matured in a week time, we will see then! 1.2 kg of white and yellow peaches and nectarines, 250g of frozen red currants and around 350g of strawberries. Net weight would be lower than usual once the rotten parts of the peaches and strawberries would be removed. 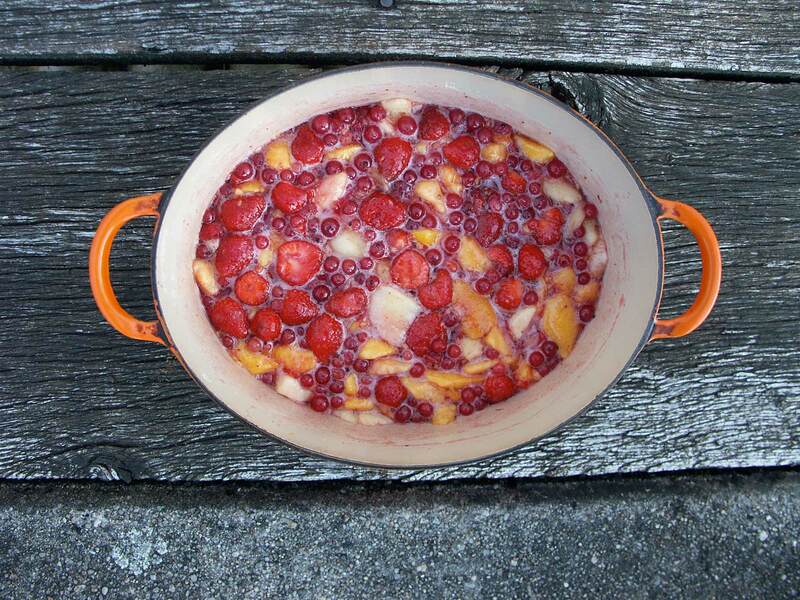 No need for a large jam pan to cook the net 600g of peaches, 250g of red currants, 250g of strawberries and 660g of sugar. I must also say that tasting a piece of white peach with a strawberry and some sweet juice while they were still raw was quite a pleasant experience. A fruit salad would have been an other great way of eating this fruit, with maybe only a tenth of the amount of sugar and half the amount of red currants. 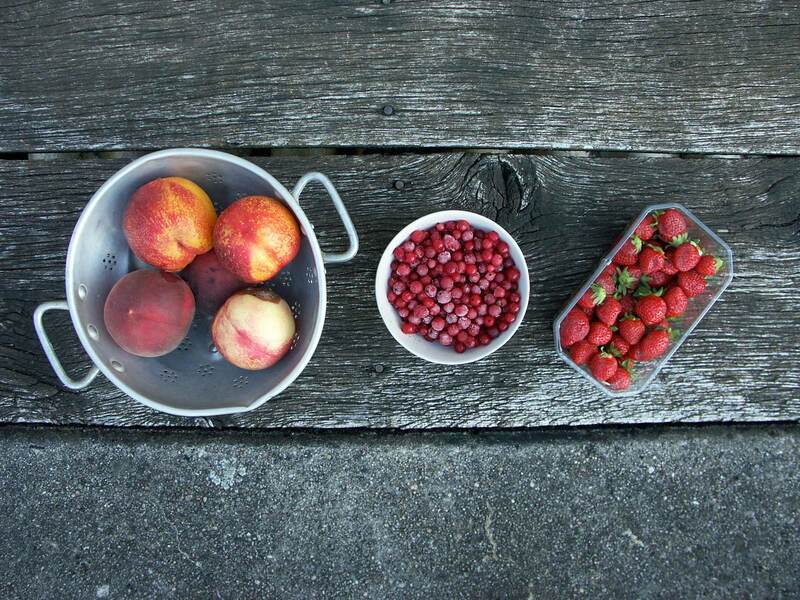 This entry was posted in Eat, Stories and tagged Aurillac, France, Peaches, Redcurrants, Strawberries by Les Jardins d'ici. Bookmark the permalink. I brought a jar for sharing at the show “Le Banquet de la Vie (The Banquet of Life)‘ at the Aurillac Festival of street theatre, where not only us spectators enjoyed the actors’ performance but also the food that we brought with us. 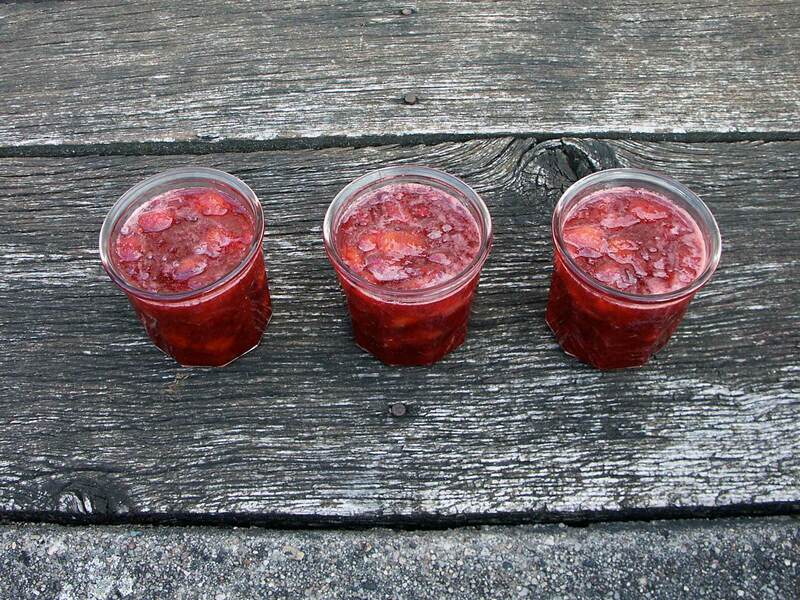 It confirmed that jam is, at least in France, something that generates empathy when it has been home-made. As for taste, strawberry was surprisingly dominant given the small amount added to the mix. Consistency: the jam remained runny. People who like set jam could have put maybe twice the amount of red currants to reach a result more in line with their expectations. Cooking the jam for longer, maybe 25 minutes in total, would probably have been the best option to that end though.